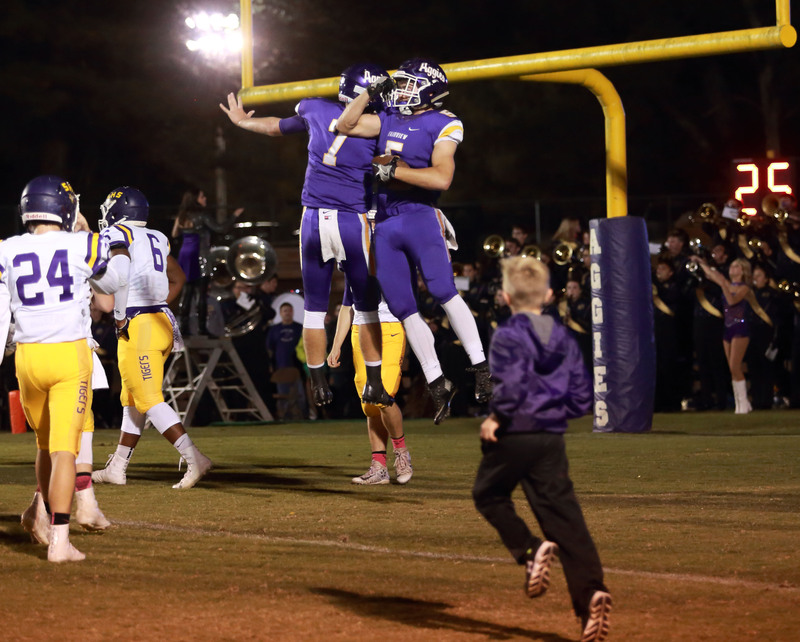 FAIRVIEW – Seniors Logan Brooks and Ragan Ashley made sure the only varsity football game they ever played at Fairview's Dafford Smith Stadium would not end in heartbreak. Both were superior running the football Friday evening, especially in the fourth quarter as they helped the Aggies pull out a 21-17 victory over the Springville Tigers. This was the first game in more than three years the Aggies have played on their home field; the stadium bleachers were condemned just before the start of the 2013 season, the new ones getting the stamp of approval from a state inspector only days ago. Though only the home side was open to spectators, Fairview enjoyed a sweet and long-dreamed of return home. A good crowd enjoyed the festivities, in particular the fine efforts by two teams who have struggled throughout the 2016 season in 5A, Region 6 play. In the fourth quarter, Brooks and Ashley were responsible for a 15-play, 80-yard drive that enabled the Aggies to regain the lead. The duo combined for 109 yards rushing in the final period, and for the game, accounted for 286 yards between them and three touchdowns. Many Fairview seniors made plays throughout the evening, the only game they’ll ever play for coach George Redding in Dafford Smith Stadium, saying goodbye to their home field in great fashion. A fumble by Springville's Peyton Weisskoff was recovered by the Aggies' Sambo Woods at the Tigers' 12-yard line. Brooks ran up the middle to the end zone on the next play and the extra point from Jaxxon Swann gave Fairview a 7-0 lead at 7:13 of the first quarter. Springville answered with a 78-yard drive, thanks to a 38-yard run from Jordan Byrd that got the ball inside the Fairview 20. The TD came on a 1-yard run by Hunter Richardson with the extra point from Ross Stanford making the game even at 7-7. On the fourth play into the second stanza, the Tigers took their first lead when Hunter and Weisskoff teamed up on a 30-yard pass play. Stanford's conversion was good and the visitors from St. Clair County went up 14-7. The Aggies began in bad field position on the following series, but got out of trouble with a 39-yard gain from Ashley to move the pigskin near midfield. Brooks found a seam up the middle and was gone 48 yards for the touchdown with 9:59 left in the quarter. Swann's extra point made it a new game at 14-14. Fairview had a chance to take the lead before time ran out, but Woods could not catch a pass from Ashley in the right corner of the end zone and the Aggies lost possession on downs. Springville ran out the clock with the battle even at halftime,14-14. Taking the second half kickoff, the Tigers used 17- and 20-yard runs from Troy Vance to move the football into the Fairview red zone. But the drive stalled and a field goal from 30 yards by Stanford was good, sending the Tigers back in front at 17-14. A penalty on a punt return by Byrd nullified an 85-yard return to the end zone. The Tigers however, got the ball deep into Fairview territory on a 51-yard pass play. As the series went into the fourth quarter, Stanford missed a field goal from the 29 and the Aggies took over. This was the biggest drive of the night for Redding's squad, who moved the ball to the Springville end zone in 15 plays and used more than 5:00 of time. Ashley got the touchdown when he ran off right tackle and got free for a 17-yard jaunt and the Aggies regained the advantage at 21-17 with 5:38 remaining. Springville was unable to move the ball steadily in its next series and had to punt. Fairview took it from the Tigers' 49 and picked up three first downs and more than 20 yards to run out the clock and celebrate a special night for the team, along with the community. Former head coach Dafford Smith was given a game ball that was brought in by a helicopter prior to kickoff. The victory line when the Aggies came on the field covered better than 60 yards, with students and adults having the opportunity to see a football game played on the field for the first time in 1,098 days. Now the Aggies can look to end the regular season with a positive finish when they travel to Holly Pond next week. The Broncos are in the playoffs for the first time since 2011 and come in to the game 6-3 and on a three-game winning streak at home. Fairview is now 30-8 all-time in games at Dafford Smith Stadium in better than seven years under Redding, a winning percentage of more than .780.